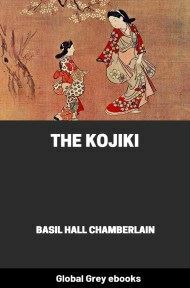 Chapters include, My First Day In The Orient; The Writing Of Kobodaishi; Jizo; A Pilgrimage To Enoshima; At The Market Of The Dead; Bon-Odori; The Chief City Of The Province Of The Gods; Kitzuki: The Most Ancient Shrine In Japan; In The Cave Of The Children's Ghosts; At Mionoseki; Notes On Kitzuki; At Hinomisaki; Shinju; Yaegaki-Jinja, and Kitsune. 'Do not fail to write down your first impressions as soon as possible,' said a kind English professor [Basil Hall Chamberlain: PREPARATOR'S NOTE] whom I had the pleasure of meeting soon after my arrival in Japan: 'they are evanescent, you know; they will never come to you again, once they have faded out; and yet of all the strange sensations you may receive in this country you will feel none so charming as these.' I am trying now to reproduce them from the hasty notes of the time, and find that they were even more fugitive than charming; something has evaporated from all my recollections of them—something impossible to recall. I neglected the friendly advice, in spite of all resolves to obey it: I could not, in those first weeks, resign myself to remain indoors and write, while there was yet so much to see and hear and feel in the sun-steeped ways of the wonderful Japanese city. Still, even could I revive all the lost sensations of those first experiences, I doubt if I could express and fix them in words. The first charm of Japan is intangible and volatile as a perfume. It began for me with my first kuruma-ride out of the European quarter of Yokohama into the Japanese town; and so much as I can recall of it is hereafter set down. It is with the delicious surprise of the first journey through Japanese streets—unable to make one's kuruma-runner understand anything but gestures, frantic gestures to roll on anywhere, everywhere, since all is unspeakably pleasurable and new—that one first receives the real sensation of being in the Orient, in this Far East so much read of, so long dreamed of, yet, as the eyes bear witness, heretofore all unknown. There is a romance even in the first full consciousness of this rather commonplace fact; but for me this consciousness is transfigured inexpressibly by the divine beauty of the day. There is some charm unutterable in the morning air, cool with the coolness of Japanese spring and wind-waves from the snowy cone of Fuji; a charm perhaps due rather to softest lucidity than to any positive tone—an atmospheric limpidity extraordinary, with only a suggestion of blue in it, through which the most distant objects appear focused with amazing sharpness. The sun is only pleasantly warm; the jinricksha, or kuruma, is the most cosy little vehicle imaginable; and the street-vistas, as seen above the dancing white mushroom-shaped hat of my sandalled runner, have an allurement of which I fancy that I could never weary. Elfish everything seems; for everything as well as everybody is small, and queer, and mysterious: the little houses under their blue roofs, the little shop-fronts hung with blue, and the smiling little people in their blue costumes. The illusion is only broken by the occasional passing of a tall foreigner, and by divers shop-signs bearing announcements in absurd attempts at English. Nevertheless such discords only serve to emphasise reality; they never materially lessen the fascination of the funny little streets. 'Tis at first a delightfully odd confusion only, as you look down one of them, through an interminable flutter of flags and swaying of dark blue drapery, all made beautiful and mysterious with Japanese or Chinese lettering. For there are no immediately discernible laws of construction or decoration: each building seems to have a fantastic prettiness of its own; nothing is exactly like anything else, and all is bewilderingly novel. But gradually, after an hour passed in the quarter, the eye begins to recognise in a vague way some general plan in the construction of these low, light, queerly-gabled wooden houses, mostly unpainted, with their first stories all open to the street, and thin strips of roofing sloping above each shop-front, like awnings, back to the miniature balconies of paper-screened second stories. You begin to understand the common plan of the tiny shops, with their matted floors well raised above the street level, and the general perpendicular arrangement of sign-lettering, whether undulating on drapery or glimmering on gilded and lacquered signboards. You observe that the same rich dark blue which dominates in popular costume rules also in shop draperies, though there is a sprinkling of other tints—bright blue and white and red (no greens or yellows). And then you note also that the dresses of the labourers are lettered with the same wonderful lettering as the shop draperies. No arabesques could produce such an effect. As modified for decorative purposes these ideographs have a speaking symmetry which no design without a meaning could possess. As they appear on the back of a workman's frock—pure white on dark blue—and large enough to be easily read at a great distance (indicating some guild or company of which the wearer is a member or employee), they give to the poor cheap garment a fictitious appearance of splendour. And finally, while you are still puzzling over the mystery of things, there will come to you like a revelation the knowledge that most of the amazing picturesqueness of these streets is simply due to the profusion of Chinese and Japanese characters in white, black, blue, or gold, decorating everything—even surfaces of doorposts and paper screens. Perhaps, then, for one moment, you will imagine the effect of English lettering substituted for those magical characters; and the mere idea will give to whatever aesthetic sentiment you may possess a brutal shock, and you will become, as I have become, an enemy of the Romaji-Kwai—that society founded for the ugly utilitarian purpose of introducing the use of English letters in writing Japanese. An ideograph does not make upon the Japanese brain any impression similar to that created in the Occidental brain by a letter or combination of letters—dull, inanimate symbols of vocal sounds. To the Japanese brain an ideograph is a vivid picture: it lives; it speaks; it gesticulates. And the whole space of a Japanese street is full of such living characters—figures that cry out to the eyes, words that smile or grimace like faces.